In the following post, we describe another necessary user-oriented improvement related to search functionality. Amasty Improved Sorting for Magento 2 and 1 increases the usability of the default Magento catalog with the help of additional search options. Having installed the module, you provide your clients with the ability to browse your website by such parameters as best sellers, top rated, most viewed, and new items, goods from wishlists, and more. As a store owner, you get a perfect opportunity to push bestsellers to the top, increasing the effectiveness of your cash cows. As you can see, the extension allows website visitors to search for required products most conveniently. Sorting by name or price never provides visitors with enough understanding about what’s happening on your store. They can only see some boring facts (one item costs more than another), but with Amasty Improved Sorting things essentially change. You provide some new sorting options that indicate products by certain parameters. Consequently, potential buyers can easily filter out bestsellers or the most rated goods. Furthermore, it is even possible to sort products by savings! The selection of goods is rearranged according to the difference between regular and special price. The bigger the difference is – the more a customer can save. This sorting parameter is helpful during sale seasons when you promote lots of products with special price. 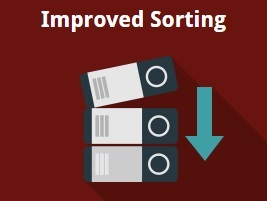 With the help of this Magento 2 sorting options extension, visitors can rapidly discover the best offers. Sorting by best sellers is also possible with the Amasty Improved Sorting Magento 2 module. This parameter provides the best understanding of what other buyers prefer. Furthermore, you can customize the order of items from the backend to promote specific products. Another option allows discovering the newest products which are displayed at the top of the category page. 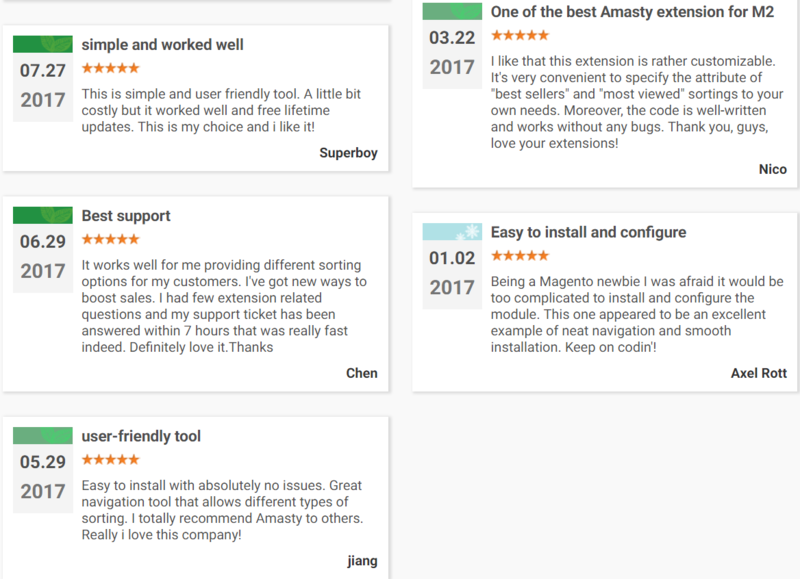 Besides, the Amasty Improved Sorting Magento 2 extension enables users to sort products by the number of reviews or reviews count. Note that the module is compatible with Yotpo Reviews, which allows you to sort items by Yotpo reviews count. At the same time, you can display top rated products first. If a buyer wants to discover what other store visitors have in their wish lists, the module allows the appropriate option. Sorting by the presence in wishlists is represented by the Now in Wishlists option. The more the item is available in wish lists – the higher its position on a category page. The number of views can also be a basis for sorting. Views are generated much faster than orders, so this sorting parameter provides a great understanding of which products attract the attention of visitors. As mentioned above, you can customize the display of products via backend. This feature works for Bestsellers and Most Viewed lists, so if you want to promote particular products, Amasty Improved Sorting will be helpful for this. Moreover, you can utilize drag and drop tool to set the order of sorting options in the way you want them to be positioned in the drop-down list on your storefront. As for other advanced management features, the module allows you to set the descending order by default. In out-of-the-box Magento 2, ascending order is used, so it is impossible to display the cheapest items at the end of the list. Luckily, we have the Amasty solution that knows how to fix the problem. Also, as it was just mentioned, out of stock products or products with zero quantity (these are two slightly different types) can be shown at the end of the page. Also, note that each new sorting option can be set as default. Besides, you can change the sort order for specific categories. You can configure the extension under Stores -> Settings -> Configuration -> Amasty Extensions -> Improved Sorting. All settings are divided into 8 sections: General, Newest, Bestsellers, Most viewed, Biggest Saving, Now in Wishlists, Top Rated, and Reviews Count. In the General settings, you activate such features as Show Products without Images Last, Show “Out of Stock” Products Last, Use qty to determine if the product is “Out of Stock”, and Hide “Position” Sorting Option for Customers. In “Sort attributes descending by default”, you can select multiple attribute values. In the same section, you can disable sorting by specified options, set the default sorting type on search pages, and enable/disable debug mode. Besides, here you apply the order of sorting options using drag and drop tool. As for the Newest settings, in the Label field, you specify a name of the sorting option to be displayed on the frontend. Then, choose an attribute code for the Newest Sorting. Leave blank to use product creation date. In Bestsellers, create a label for this sorting option, enter a period in days for bestsellers display, or leave blank to let the extension use lifetime stats. 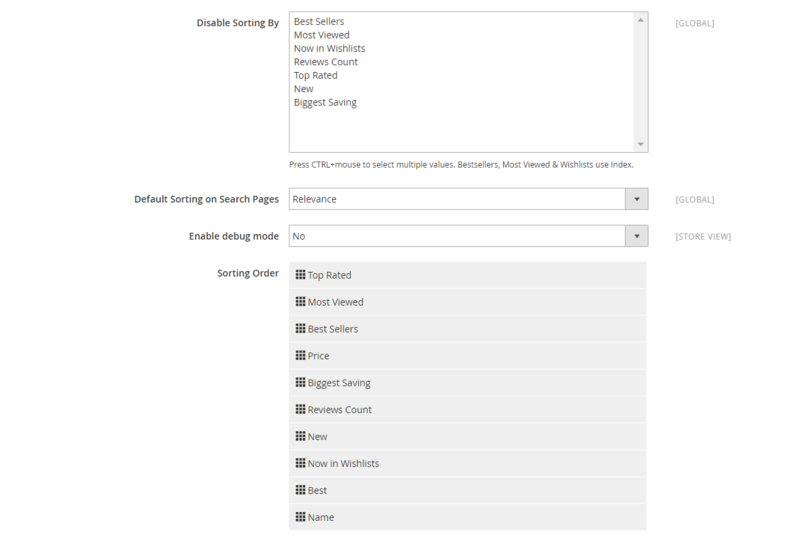 As for ‘Custom Bestsellers Attribute’, you can use this field to move specific products up in the list of bestsellers. If it is left empty, the extension shows real data. ‘Exclude Orders Status’ is used to fine-tune the bestsellers list by disabling products with selected statuses. In the Most Viewed tab, specify a name for the frontend display, set the period for statistics to be used, and enter custom attribute code to move some products up artificially. In Biggest Saving, you enter a sorting label and decide whether to use percentage for the difference between regular and special prices. If you select No here, absolute price value will be applied to the sorting. The Now in Wishlists tab lets you create a sorting name visible on the frontend and set a period in days for the data update related to adding products in customers’ wishlists. For the Top Rated and Reviews Count settings, specify an option frontend name in the relevant fields. A new function was introduced: possibility to set the order of the sorting options for their proper position display in the ‘Sort by’ list on the frontend. 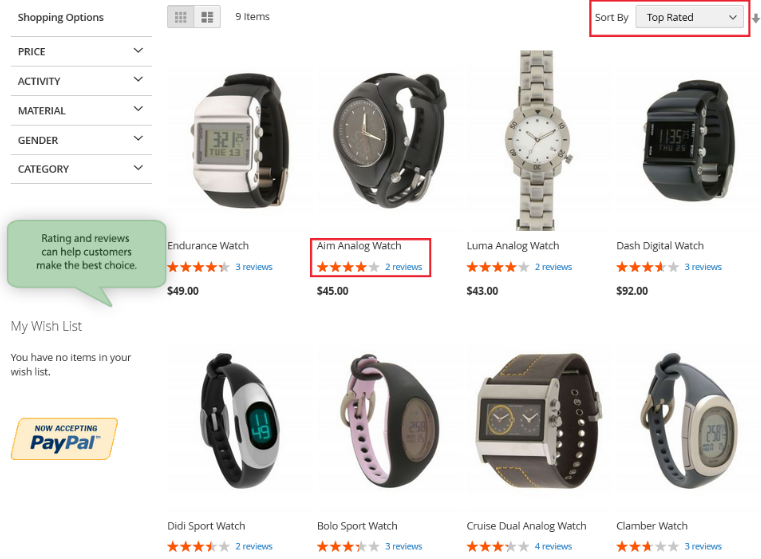 Now it is possible to use sorting by Yotpo reviews instead of default Magento reviews. A new function was added: products sorting query in the log file (/var/log/system.log). The primary keys were added to the DB tables. New indexing algorithm was added according to Magento devdocs guides. Ability to set custom names for the sorting methods was implemented. Every ecommerce website should be user-friendly and intuitive, so it is critical for Magento merchants to install such tools as Amasty Improved Sorting. Being a vital improvement to the default Magento functionality, it provides customers with all the desired sorting options. The price of the Magento 2 extension is $199, while its predecessor costs just $79.